MINOT, North Dakota, June 22, 2011 (ENS) – Minot city officials, residents and the North Dakota National Guard today worked together to ensure a safe evacuation of some 12,000 people and 4,200 homes in Minot, as the Souris River overtopped its levees, flooding streets and washing away some homes. Officials say this is the worst flooding in four decades. Warning sirens sounded across the city today, notifying residents that they must leave and take their belongings to avoid the historic flood waters as they spilled over the sides of levees for the second time in a month. Some Minot levees are not likely to hold. Secondary dikes are being built to protect infrastructure and sandbagging efforts continue. Broadway Bridge may have to close, cut the north side of Minot off from the south side. Guard members will work through this evening alongside the local authorities to make sure all identified homes are evacuated. At the same time, more than 275 Guard members are in the Bismarck and Mandan area providing traffic control, conducting levee patrols and being ready to react quickly in the event of an emergency. The Guard has been serving on flood duty in North Dakota’s central region for the past 30 days and today assisted with the second flood evacuation within a month. 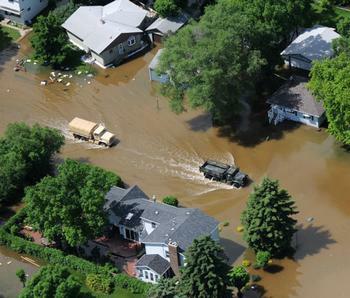 On May 31, about 10,000 residents of the same area were ordered to evacuate as the Souris River splashed over the levees and into the streets. The Souris River flowing south from Canada through north-central North Dakota is swollen with heavy spring snowmelt and rain on both sides of the border. Heavy rainfall during the last 48 hours in the Dakotas has totaled approximately six inches, according to the National Weather Service. The flooding in Minot, population 41,000, is expected to surpass the historical 1881 level of 1,558 feet on Friday and hit 1,562.5 feet early Monday, according to the National Weather Service. Increased releases from Canadian reservoirs continue flowing into Lake Darling in North Dakota. Inflows to Lake Darling are expected to peak at 20,250 cubic feet per second on June 27. Releases from Lake Darling also increased, contributing to the severe flooding in Minot. Due to heavy rainfall, releases from Lake Darling need to be increased, also contributing to the flooding of Minot and rural areas. The U.S. government is not going to cover the losses suffered by individuals in severe flooding across North Dakota that has been going on since mid-February, says Governor Jack Dalrymple. The governor received word June 16 from Craig Fugate, administrator of the Federal Emergency Management Agency, that the state’s application for FEMA’s Individual Assistance program has been denied. Dalrymple has drafted a response and has left messages with Fugate, expressing his dismay that FEMA would conclude major flooding in North Dakota has not caused significant damage to warrant federal assistance to homeowners and businesses. The federal government is assisting with flood relief, however. On June 7, President Barack Obama approved Governor Dalrymple’s request to expand the state’s flood disaster declaration to include Billings and Divide counties. The disaster declaration now covers 42 counties, the Spirit Lake Nation, the Three Affiliated Tribes and the Turtle Mountain Band of Chippewa reservations. The presidential disaster declaration makes available federal funding to help state and local communities cover the costs of building levees and other measures taken to safeguard people and property from flooding. The disaster declaration also provides federal assistance to help cover the costs of flood mitigation efforts undertaken since February 14, 2011, as requested by Governor Dalrymple.